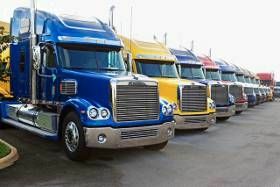 Questions on " The High Road CDL training Program"
I recently passed my CDL permit for Missouri with all endorsements (except Charter & School Bus). I originally started studying the CDL guide by DMV, but it was taking a lot of time to go through and learn what I needed to learn. I don't have any trucking influence in my past, so learning the tractor and trailer parts and processes was very challenging. I didn't know what a spring hanger was, so I decided to Google it up to further educate myself. In this process I ran across one of Brett's posts and dove in a little further and there found Trucking Truth and the High Road Training program! I didn't realize that I had found "Trucker's Gold!" I was pleased at the layout of the High Road program. The short sections were easy to understand, but long enough to have the content I needed to learn to pass my permit exams. The other sections completely provide the support any driver could ever need. When I got down to the cargo & paperwork sections, I must say that I was tempted to skip as those more than likely not be on any required exam. That would have been a huge mistake had I done that. Even the New York State Coil section was good information to have. My advice is to go through it all! Go through it thoroughly the first time. I had a basic rule that if I missed more than 1 question on a section, I would repeat it until I understood it. After going though it all, I reviewed each section required for my exams right before going to test. I passed every test with some perfect scores and none under 88%. I think I missed 4 questions total on general, combinations, air brakes, tankers, doubles & triples, & Hazmat exams. Some people have test taking anxiety. This is normal! We put pressure on ourselves because our future livelihood is on the line. But relax & trust what you've learned from the TT/High Road materials. You will do fine! The exam system that I had to use, allowed me to skip questions. It would end the exam after I had answered the correct number of questions. So if you're nervous as hell, just move on to another question that you'll probably know. Even though I had studied very thoroughly, I had a couple of questions that I didn't like how the answers were worded, so I skipped them and moved on to the next question. Every time I had to do that, I finished the exams before reaching the final question. I never needed to go back and try to answer any skipped questions. This method should allow you to score higher. Although the Pre-Trip inspection isn't a part of the written exams, I found the flashcards very helpful to solidify what I had learned from the practice test & questions. This helped me to have a more solid visual picture of what a lot of the individual components were and what I should be looking for during test but also to start developing the habits I will need everyday and at every stop as a professional driver. Keep your nose to the grindstone, eyes on road, & keep on Truckin'! I used the High Road Training program to help me pass my Missouri CDL (Class A) Permit and Endorsement Exams. I went through each section very carefully, repeating a page if I missed more than one question. I went through all of the pages. I really appreciate the pages on cargo securement and the pages about Hours of Service (even though I know that I'll be using a EOBRD!). I'm planning on going with Prime, but I have to get me blood pressure under control first. I'm using the Pre-Trip Flash Cards to start getting ready for the Pre-Trip part before I go down to Springfield, MO for the training. I'm staying open minded to the fact that the instructors will probably have a way that they want things said. In preparation for the Pre-Trip, I copied the 7 step Pre-Trip from the Missouri CDL manual. I did this to make sure that there wasn't anything special about Missouri that might be important. Not having any experience in this industry, I have relied heavily on the information provided by TT. The honest candor and comments are greatly appreciated and welcomed. Brett's book is a good read, and Brian from Sacramento did an awesome job with the Pre-Trip inspection stuff. I have used this site almost exclusively to do my research for my exams and about company sponsored CDL schools. My fiancé and I are looking to start a new career and TT has been a big help it making our decisions. Thanks to Brett and crew for an awesome website dedicated to the trucking industry. I am looking forward to this new chapter In my life and I hope to learn a lot so I can help others like this site has helped me.